First of all, I hope all of our American friends had a fantastic Thanksgiving yesterday and are recovering well from turkey-induced food coma. What better opportunity to express how thankful I am for all of you and your support, and for all your patience as we work hard to get the first playable prototype version of KTP ready! These past couple weeks have been extremely productive, and I look forward to sharing a number of updates with you about our progress, starting...immediately! I've recently been focused on making significant revisions to the game's artificial intelligence system -- how it is structured overall (to make it easier to extend and maintain in the future) and how individual components work. One of the most important components we're getting ready for the prototype is the system that allows each character in the game to detect and identify the people and objects around it and react accordingly. 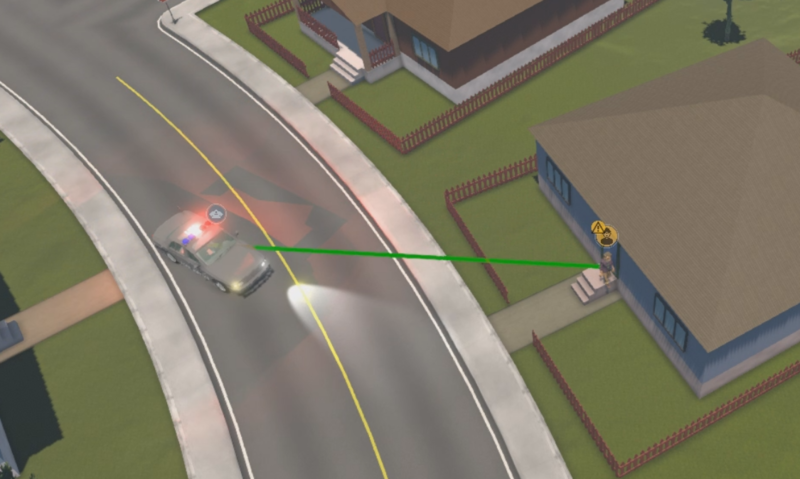 It's this system that enables a suspect to flee a crime scene when they spot the arrival of officers, and it's this system that allows your officers to search for, find, and pursue a fleeing a suspect, for example. And by influencing how this system works -- through environmental effects like weather or light; distractions; or the conspicuity or stealth of your officers -- we hope to open the door for many different tactics. A loudly approaching marked car is easily spotted by this suspect, who is now fleeing the scene. For full Alpha Team members, we've just posted a new update in the Development Updates forum that describes in more depth how we're building out this system. If you're already a member, check it out! If not, we hope you'll consider supporting our development through Alpha Team. We need your help to make Keep the Peace into the best game it can possibly be! Posted: 23/11/2018 6:45 pm. Flixter101, T84LL, JVR and 6 people liked.